At the northernmost point of Ireland is Malin Head, where according to the proprietors of Farren’s Bar, Ireland’s northernmost pub, the sun shines most of the time. This was certainly true when I arrived from Horn Head where the morning had been wet with a misty rain.Malin Head is a remarkable place to visit and do a little light hiking. The views are spectacular and the cliffs as grand as any in Ireland. 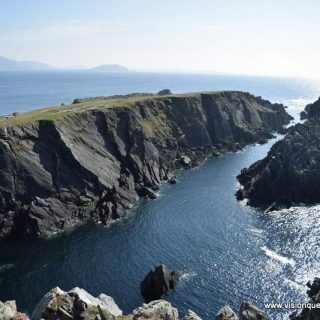 Even better, for those of us seeking to connect with the ancient and mythic past, Malin Head is known by another name: Fódla’s Crown. Banba was one of three Tuatha De Danann queens or goddesses, all sisters representing the sacred feminine of Ireland. Eiru. from whom Ireland draws her name of Eire, represents the whole of the land. Fódla represents the parts, and Banba the vertical axis from earth to the divine from Aill na Mirean, at Midhe on Uisneach Hill in County Westmeath. Thus it is that Banba, representing the parts of the land of Ireland, has her crown at the northern point of the island. For those so inclined, Malin Head is a serene, albeit windy place to spend some time in reflection and connecting to the ancient spirits and energy still found in so many places in Ireland. Visiting here on your own is easy with a car. For a tour operator who customizes trips here and to nearby Horn Head, contact Ancient Ireland Tourism for either a custom excursion or as part of their Ulster and Northern Tour.